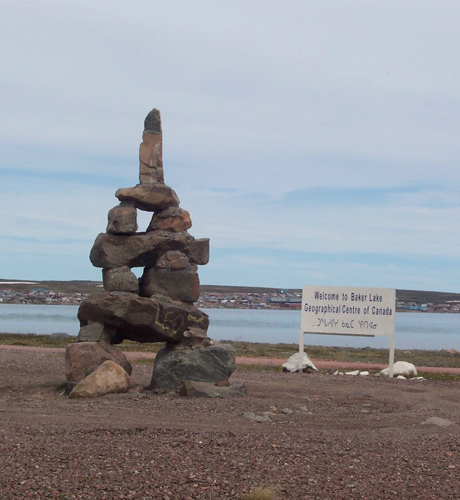 The community of Baker Lake sits at the mouth of the Thelon River on the shore of Baker Lake, and is Canada’s only inland Inuit community. Traditionally a gathering place for many different groups of Inuit, the community is now home to many Inuit artists and carvers. Carvers work on medium suitable to large-scale pieces in the local dark grey to black stone that, although hard, generally accepts detail and polish. Baker Lake carvers explore family, hunting, animal, spiritual and mythic themes. The art of printmaking in the North was pioneered in Baker Lake in the late 1950s. Baker Lake print imagery is generally bold and colourful with an emphasis on shamanistic and supernatural subject matter which became very popular with collectors. A fire closed the original print shop but it has now been rebuilt and new collections of Baker Lake prints started again in the late 1990s. The Baker Lake community has a rich history of Printmaking. Initiated in 1970 as a means to disseminate the artwork of the Inuit people of Baker Lake, then a part of the North West Territories, the Baker Lake Printmakers Co-operative provided printmaking facilities and connections with the south to produce and exhibit portfolios of their outstanding artwork. Precedents for the Inuit Print studio had been set by the Cape Dorset and Baffin Island Print Co-operatives in the 1950s and 60s providing alternative sources of income for people as they began to live in established communities rather than nomadically hunting for their livelihood. The various print co-operatives of the North produce a wide range of styles and subject matter that highlight the cultural diversity among the Inuit people and the unique artistic expression of individual artists. The print studios provide not only a way of making a living but a form of cultural affirmation. The prints created at the Baker Lake Printmakers Co-Operative are made through the incorporation of stone-cut relief and stenciling. The laborious process of stone-cutting is used to create the primary black-line image while color is sparingly applied with care and consideration through stencil. Although it takes a considerable amount of physical effort to produce the stone plates, the resistance and efficiency in printing provides an ideal process in a location where access to materials and equipment can be limited at best.